The Speedway Headquarters in Brighton is about to undergo a major renovation and will be brought back to life soon with exciting new uses. But before a groundbreaking happens, Architectural Heritage Foundation wants to reach out to the community and highlight the Speedway’s unique courtyard (and give a little preview of things to come) by hosting a great yoga class for the community. They are hoping to bring some positive energy to this site while they plan for the site’s renovation! 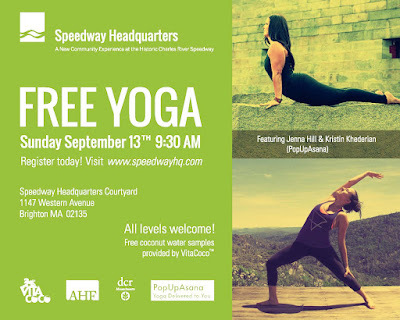 This FREE yoga event will be on Sunday September 13, 2015 at 9:30am. It is an all-ages yoga class and is a great way to start your Sunday morning and energize the rest of your weekend. Be sure to bring your own yoga mat!